This is our very first blog post on the new website! I could not be more thrilled to be sharing Allison & Justin's wedding day as a way to celebrate! After you've checked out Allison & Justin's gorgeous day, take a moment to poke around our new site - there are lots of new things to see! These two are the sweetest - we love it when clients make us feel like friends or family, and not just like hired help. And that is just what these two did! They welcomed us with open arms. We are always excited to see our brides and grooms, but when we can tell they are excited to see us as well - that just feels so good! Loving people is clearly a priority for these two, and we felt oh so loved by them - as I'm sure all their family and guests did as well! Allison beams and lets out a little squeal when she sees you, immediately hugging you tight. And Justin - he likes hugs too and he let's everyone know they are appreciated. Allison and Justin's wedding was a Christmas dream. They managed something that sometimes seems impossible: a Christmas wedding that compliments the season in a classy, sophisticated way. To keep from feeling elementary with bright greens & reds, they tapped into silver and gold elements for sophistication, while still maintaining the warmth of the season with lanterns and a cranberry-centered color scheme. We're especially in love with the cosy fireplace at the reception, complete with classic stockings and a tree - All designed by the wonderful Legacy Farms planners! But what was best of all was the uninhibited joy between this beautiful couple and all their family and friends. Everyone was completely happy to be together - which is what weddings, and Christmas, are all about! Allison readily describes herself as "a very big 'family' person." She shares, "I wouldn't officially be Justin's girlfriend [until] I knew my family loved him and he loved them," she says. "I'll never forget the first time he met them...we were going to eat at a restaurant after church and my niece, Emma Kate fell in love with him...it went better than I could have ever thought, and it melted my heart to watch him interact with all my nieces and my nephew!" Clearly the chemistry between these two also worked down through their families - what a rare and wonderful gift! "There weren’t any turning points, I always loved her." Well, dang Justin - melt our hearts why don't you?! Thanks for stopping by to see Allison & Justin's big day! Don't forget to leave them some love in the comments of this post! 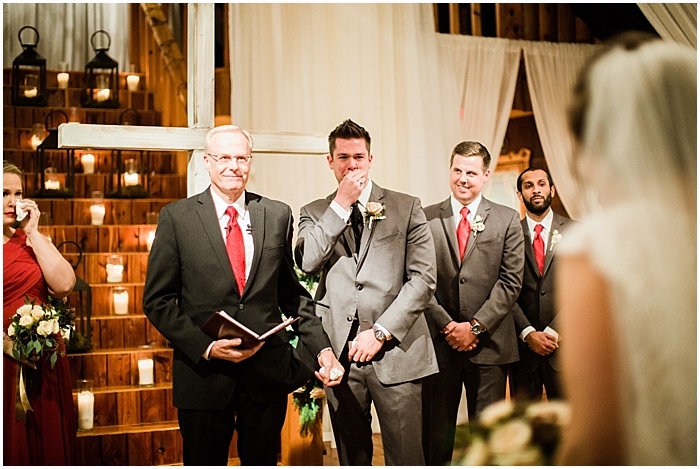 Sarah Sidwell is a Nashville based wedding photographer living in Franklin, Tennessee. Sarah specializes in wedding, newborn, baby, and family photography.